Change management's purpose is clear: to ensure that changes deliver intended results and outcomes by addressing one of the most critical elements of successful change, the people side of change. Employee adoption and usage are the bridge between a great solution and ultimate results. In practice, change management plays out on several different levels within the organization. Change management at the project level is about ensuring that a project achieves its intended results and outcomes by supporting the individual transitions required by that project. When you install a new technology, employees must adopt and use it to deliver value. When you implement a new process, employees must adopt and use it to deliver value. Project level change management provides the specific strategies, plans, actions and steps that focus on impacted employees and work in alignment with a project deployment. Change management, at the project level, can be applied on any project or initiative that impacts how employees do their jobs. Some changes impact hundreds of employees while others impact thousands. Changes can be driven by external factors, internal factors or some combination of both. Changes can impact processes, systems, tools, organization structures or job roles (or any combination thereof). But if a change requires employees to do their jobs differently (by exhibiting new behaviors, following new processes, using new tools), then there is a role for project level change management. 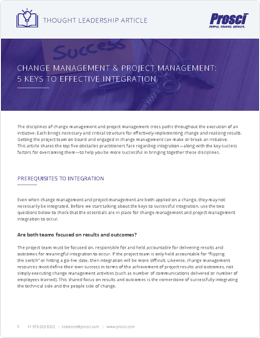 From the project perspective, change management is the set of activities (the processes and the tools) applied to a particular project or initiative to drive adoption and usage. But, is that how you would tell a project team what change management is? What is Change Management at the Project Level? As change management practitioners, it is important that we understand what change management is and, more importantly, how we present what change management is to the project teams we work with. “Change management is the application of a structured process and set of tools to manage the people side of change from a current state to a new future state such that the desired results of the change (and expected return on investment) are achieved." While these statements don't tell you exactly what change management is, each conveys what change management is in the context of what our audiences (project leaders and senior leaders) care about and what concerns them: benefit realization, results, outcomes, ROI, adoption, usage, cost and risk. So, to answer to the question, "What is change management at the project level?" we need to know who we are speaking to. To the project leaders and senior leaders we are working to engage, change management is a solution to a problem they are experiencing (such as projects not delivering intended results and outcomes). When defining change management to a change management practitioner, change management is the structured approach for creating a strategy that drives employee adoption and usage so that projects achieve intended results and outcomes. Over the last decade, the discipline of change management has evolved and matured. The "soft and fuzzy" side of change is now addressed with rigor, structure, process and tools. Using a structured methodology helps you be direct and targeted and helps you avoid missing key considerations. In change management, one size does not fit all. The change management strategy and plans for an incremental change impacting 50 employees will look very different than the plans for a radical transformation impacting 5,000 employees. You can follow a similar process, but the resulting outputs must be scaled and customized based on the change itself and those being impacted. If no one is assigned to change management, chances are it won't get done. Prosci's research shows a direct correlation between having a dedicated resource and change management effectiveness. A dedicated resource provides focus and a single point of contact. The resource can be someone on the team or someone supporting the team, but there needs to be someone focusing on change management. Change management cannot be applied at the project level in a vacuum, without engagement from the project team. Clearly articulate the relationship between the project team and the change management resources. Define the roles and responsibilities. Work deliberately to create a partnership with a singular goal in mind—delivering the intended results and outcomes of the project. At the project level, change management is a benefit realization and value creation measure applied on particular initiatives. It is a structured approach to create customized and scaled strategies and plans to drive employee adoption and usage. It is a way to ensure that a project achieves intended benefits and outcomes, realizes ROI, mitigates costs and risks and creates value. It is a way to ensure that projects and initiatives are more successful. Change management and project management each bring necessary and critical structure for effectively implementing change and realizing results. Learn how to be more successful in bringing together these disciplines in this thought leadership article.